LinkedIn Recruiter Extractor extracts contact information from LinkedIn and LinkedIn Recruiter at an exceptionally fast rate. It is the exceptional extractor software to extract contact information such as first name, last name, email, business name, twitter, skype, address, phone number, websites, country, profile link and other important information from LinkedIn and LinkedIn LinkedIn Recruiter. 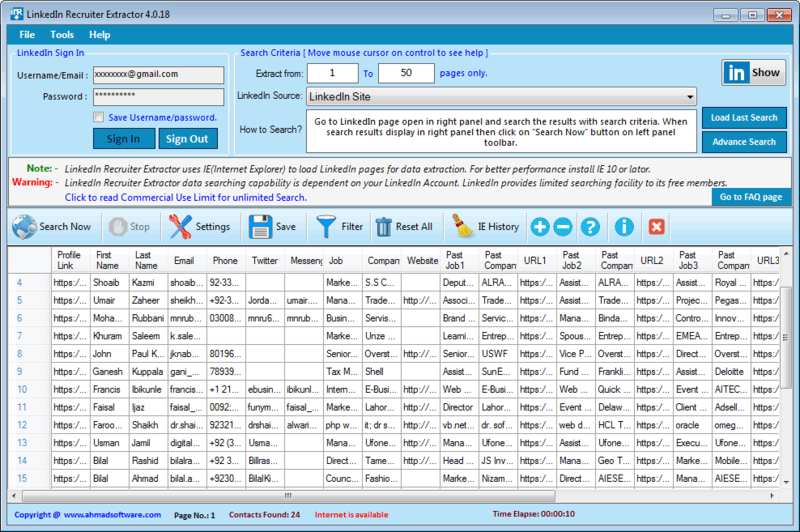 Key Features: LinkedIn Recruiter Extractor can extract your targeted customer's LinkedIn contact information and complete profile. It can extract your targeted customer's data from LinkedIn Recruiter. Lead Extractor searches your targeted customers based on your search keywords. Using LinkedIn Advanced search feature, search for people by keywords, industry, location, company, experience level, and more. Sometimes computer/software shut-downs unexpectedly; don't worry you can recover your search results just by one click. LinkedIn Recruiter Extractor has the ability to save the history of viewed and saved profiles so that already saved profile should not view again. Option to set delay between requests to simulate as is human being is surfing in a browser. LinkedIn Recruiter Extractor support Unicode character-set. You can save fetched search results in Unicode format. LinkedIn Recruiter Extractor automatically pauses/resumes on internet failure during processing. You can also apply filters to get your targeted contact list. Software provides options to save e-mail addresses in EXCEL format, .CSV files (Opens in EXCEL), TAB delimited (.txt files) format. Statement: First, please download the orginal installation package by clicking the download link. Of course you may also download it from the publisher's website. Using LinkedIn Recruiter Extractor crack, key, patch, serial number, registration code, keygen is illegal. The download file hosted at publisher website. We do not provide any download link points to Rapidshare, Hotfile, Depositfiles, Mediafire, Filefactory, etc. or obtained from file sharing programs such as Limewire, Kazaa, Imesh, Ares, BearShare, BitTorrent, WinMX etc. Software piracy is theft. If you like LinkedIn Recruiter Extractor please buy it.